Moscow and Baku move towards closer ties as Putin dispels fear of Russian support to Armenia in the Nagorno-Karabakh conflict. Russian President Vladimir Putin’s visit to Baku on August 13 after seven years has naturally raised mixed reactions around the world. A closer analysis reveals that the visit reflects a pragmatic approach of Russia in a post-Cold War world in which relations evolve with each player’s changing perceptions and interests. After the collapse of the Soviet Union in 1991, three countries emerged on the scene of the South Caucasus – Armenia, Azerbaijan and Georgia – all the three countries undergoing transitional nation-building pangs with problems ranging from territorial disputes and a power vacuum left by the collapse. The strategic location of the region between Europe and Russia and the energy resources particularly of Azerbaijan made these countries pawns in the ‘grand chess board.’ While Armenia apparently moved closer to Russia, Georgia and Azerbaijan followed a pro-Western policy, though not always consistent, and particularly under the partnership of NATO’s peace program veered more towards this alliance. This ethnically diverse region too witnessed implosion of conflicts within these states with Armenia and Azerbaijan embroiled in territorial dispute in Nagorno-Karabakh, and Georgia with troubles in South Ossetia, Abkhazia and Adjara (the first two declared separation in 2008). Russia has emerged as a major arms supplier to Azerbaijan which has increased its defence budget in past few years, enabled by its petrodollars. Ilham pointed out, “The information, not always in line with reality, regarding the volumes of the military and technical cooperation appears in mass media occasionally. As of now, the volume of the military and technical cooperation between Russia and Azerbaijan amounts to $4 billion and has a tendency to grow.” Azerbaijan has received T-90 tanks, heavy flame systems and Msta self-propelled artillery mounts from Russia. As per a report, the supply of BTR-82 armored vehicles is about to begin soon. There are also reports that the South Caucasian country is interested in S-300 missile system from Russia. Azerbaijan has apparently enhanced its defense preparedness as a possible counter offensive against its rival Armenia. Both the countries had gone to war after the collapse of the Soviet Union, in which Azerbaijan had lost, further weakening its position in Nagorno-Karabakh, an enclave within its territory but controlled by Armenia. Russia’s position on the conflict between Armenia and Azerbaijan will be definitively a key issue for Azerbaijan. 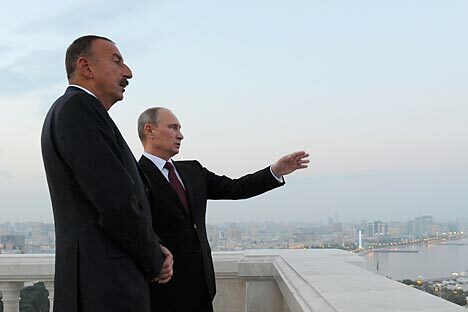 Ilham pointed out, “The fastest settlement of the conflict (in Nagorno-Karabakh) will lead to stability, predictability and cooperation in the region.” Putin during his visit to Baku dispelled Azeri fears of any Russian support to Armenia on the issue, or any support for the resolution of the conflict by force. Putin told the press, “During the talks we touched upon pressing international issues including, of course, Nagorno-Karabakh conflict. Russia is actively contributing to the soonest resolution of the conflict which is possible only by peaceful means.” He further observed, “Russia is providing active assistance to the settlement (of the conflict), which is possible only by political means.” This must be soothing to the Azeri leadership which has long perceived Russia as tilting the balance in favour of its rival. One major area of deliberation that factored during meeting was cooperation in energy. Azerbaijan has about reserve of one trillion cubic meters of natural gas, which has made it a cynosure for energy hungry countries. Though both the countries have cooperated in this sector, it is considered not very significant. Last year Azerbaijan supplied Russia 1.55 billion of cubic meters of natural gas to Russia. Among the Russian companies, Lukoil has invested in Shah Deniz gas field. Russian oil major Roseneft is interested to further explore the Azrei gas fields. Reportedly it is interested to have a stake in the Absheron gas project. At present Azeri state energy company SOCAR and the French company Total are the partners in the project. The retinue of Russian president also adds to the importance Russia attached to the visit. Besides Putin, the delegation included foreign minister, defense minister, energy minister, minister of economic development, transportation minister and top officials. It also indicates Putin’s increasing interest in the South Caucasus, which may not be welcomed by countries like Georgia which has been embroiled in bitter conflict with Russia. Putin’s success in Azerbaijan, even if in a smaller scale, will certainly impact politics of the region.